During this series on 365 Ways To Persuade and Motivate I’ve had a few posts about rewards and also some about the desire for mastery. One way to reward people is to give them praise (“Wow, you did a great job on that report”). And because we want to motivate people, and we think praise is a reward, we may tend to use it a lot. But if you are trying to stimulate someone’s internal desire for mastery, then using praise is actually counter-productive. Rewards are a type of extrinsic motivation. The motivation is coming from outside the person. It’s external, hence “extrinsic”. Praise is extrinsic. But if you have decided to use the desire of mastery to motivate people, instead of using rewards, you are using intrinsic motivation. The motivation is coming from inside the person. And the interesting thing is that extrinsic praise tends to dampen intrinsic motivation coming from the desire for mastery. In a previous post I talked about how important feedback is if you are trying to stimulate the desire for mastery. You need to give lots of feedback to people on how they are doing in order to keep that intrinsic motivation going. BUT it’s important to note that research by Mark Lepper shows that if you give a reward when people do something it dampens their desire to do it for intrinsic reasons. Valerie Shute analyzed hundreds of research studies on the use of feedback, and she reports that the best feedback separates objective feedback from praise. This makes sense in thinking about Mark Lepper’s research too. People don’t need your praise to keep going,and switching to praise takes the focus off of intrinsic motivation and puts it on extrinsic motivation. This may actually decrease the desire for mastery. The second way combines feedback and praise. It might make Jerome feel better, but it probably confuses Kathleen. Did she do the cleaning correctly or not? You are going to have to decide whether to use the desire for mastery to motivate a particular person in a particular situation, or a reward. The desire for mastery is more powerful, so if possible try that first. And don’t mix in rewards with desire for mastery techniques. If you are going for the desire for mastery then keep your feedback objective and free of praise. What do you think? 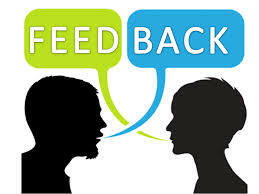 Have you tried different kinds of feedback? Shute, Valerie. 2007. Focus on Formative Feedback. http://www.ets.org/Media/ Research/pdf/RR-07-11.pdf. Lepper, Mark, David Greene, and Richard Nisbett. 1973. “Undermining children’s intrinsic interest with extrinsic reward: A test of the ‘overjustification’ hypothesis.” Journal of Personality and Social Psychology 28(1): 129–37. Hello Susan, it is a very interesting job you do as a researcher and psychologist, I wish there was more people giving attention to this area, mainly marketing people.